So, What do you think? My own design!﻿ Yes, I know traditional, but that is ok. I have been wanting to do something with toile, so here it is. I was inspired by Charlotte Angotti, after seeing her at Greater Columbia Quilters in Aug. She used large prints with large snowball blocks to show them off. So, off I went. I have also wanted to do a red quilt. Two for one. Still have to put the binding on. Out of the red, so will have to be the black. Originally I was going to use the white with black as the inner border, but it didnt work, so I used the red from the binding. Like it allot. 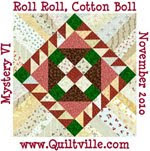 Tried to quilt free motion, from the front of the longarm, couldnt see where I was quilting. I used white thread. So swapped to a pano and worked great. So busy you cant see the quilting anyway. How do you like my name for the quilt? I am new at naming quilts. I want to use toile in a quilt also. It seems like it is not as easy to find as it once was. You are "singing my song" - I want to make a quilt that is red and white, too. I guess all of that will get put on the list for next year! 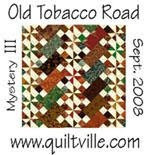 Congratulations on your design and the beautiful quilt that resulted. 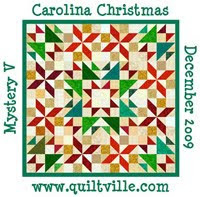 I like the name and think it suits the quilt.